If you have entered this website on this page, please go to our Home Page (click link or dark gray tab on upper left), to get an overview of our products and website contents. This page provides general information on the approximate prices of our various types of signs or plaques. Our prices depend primarily on size, whether the sign has one or two faces, materials used, and design and manufacturing complexity. We do not give specific firm prices for each sign in our Galleries on this website, except for the semi-custom signs in Gallery 9 (only 170 signs out of 8000 designs on this site). The rest of our signs are fully custom with many options on size, shape, materials, artwork, text, font styles, colors, etc. We show approximate prices for a wide range of sign types and sizes in the next section "RETAIL PRICES" immediately after the large figure below. We will give you a firm price over the phone at 951-698-8484 or in an email (please send your request to our address, info@artsignworks.com ). Once we determine your requirements for sign size, location, message, art, and design style, we will recommend a material type and a design and provide you a firm quote. If you select a similar sign that you like from one of the 8000 sign photos in our photo Galleries, and can tell us the size sign you want, we can provide an immediate firm quote on the phone or within a day by email. If you have a completely original design, we can first provide you with a quote, and then, within a few days, we will send you a color proof made by one of our four sign and graphic designers, so that you can then review and eventually approve the sign design before you commit to buy the sign. Every one of our signs are uniquely designed and manufactured from its raw materials to meet your specific design requirements and style preferences. However we do sell some semi-custom signs with only limited personalization and customization. These are made only after an order is received; they are not "on the shelf", because we personalize text, font styles, color, and sometimes wood species. They come in several sizes and sometimes several colors,. We have made dozens to hundreds of each of these. Most of these are shown in Gallery 9 - Plaques & Signs Suitable for Gifts. These are discounted about 15% compared to the prices on our custom plaques, because no original designed artwork needs to be done and the number of Proof iterations is limited to 3; however they have exactly the same materials and craftsmanship as our fully custom signs, and are not made until we receive an order. The prices are listed for each of these 170 signs & plaques on the Gallery 9 page. To give you an approximate estimate on our RETAIL prices for our custom signs and plaques, we provide approximate prices in paragraphs (A) through (D) below and in the table in Fig. 4 halfway down the page. We show prices for both signs and wall plaques here; however a more detailed price list for plaques only is shown on our other website, www.woodmetalplaques.com, on our Price page (click to see this page). Prices for the same size plaque and style are the same in both lists. All our custom signs and plaques are hand-crafted and hand-painted by experienced and talented American craftsmen and artisans. Every sign & plaque we make takes from 2 1/2 to over 30 hours of labor. The premium raw materials we use (HDU sheets, wood lumber, Matthews and 1-Shot sign paints, 24K gold leaf, etc.) comprise about 35% of the sign's cost. Because these are custom and hand-made, rather than mass-produced by machines overseas, we cannot offer bargain basement prices, but we do price our premium products as low as possible and still be a viable business. If you compare our prices with comparable high-end products from other companies, you will see our beautiful and long-lasting signs and plaques are affordable and well worth the price. Our least expensive dimensional signs are in Product Line 1, 2.5-D carved and sandblasted High-Density-Urethane (HDU) signs. These are ideal for both commercial and residential use. They are very popular, and 70% of the signs we make and show on this website are of this type. They can be just as attractive and elegant as the more expensive signs in Product Lines 2, 3 and 7. We make this type of signs in sizes from 4 inches to over 20 feet wide. They have a very long life (decades), low maintenance, and are completely waterproof. They are lightweight, and carve beautifully, because we use premium extra dense HDU, 20 lbs/ft3 (about the density of wood) instead of the 15 lb/ft3 HDU that other sign manufacturers use..Signs in our premium Product Lines 2, 3 and 7 typically cost 50% to 100% more than the signs in Product Line 1 because of the higher cost of materials and many more labor hours required to fabricate them by our craftsmen. Note on the Retail Prices listed below: The Retail prices for single-face (i..e., one side) below are approximate and are provided to give you cost data to help in your selection of a sign or plaque. Double-faced signs have prices 50% to 60% higher. These prices may change a few percent at any time. All our signs are custom, so exact prices will depend on your requested design features. Elaborate and detailed custom carved artwork, especially in 3-D relief, intricate artist painting with many different colors and shades, air-brushing, appliques, and gold or silver-leaf gilding will add to the costs below. Our approximate prices for single-face signs & plaques in the table in Fig. 4 below do not include support hardware such as posts, post brackets, scroll brackets, back studs, Z-clips, etc, which are additional, except for signs in Product Line 6, where they are included. Shipping (5% to 15% of sign cost) and sales tax (California shipping locations only) costs are extra. Because of our workload, the minimum order we presently accept, which may consist of custom or standard signs, hardware, brackets, etc., is $150. Our delivery time, from the time you please a firm order with a PO or down payment, until shipping, is 4 to 5 weeks. We do take rush orders when our work load permits it, but our absolute minimum time is 2 to 3 weeks for small, simple signs. it tales over a week for multiple coats of paint to dry. Please call us at 951-698-8484 or EMAIL us at info@ArtSignWorks.com for firm "no obligation, no hassle" quotes on specific sign designs. Our friendly and knowledgeable customer service representatives, Christie and Regina will be happy to provide more information on our products and prices, including designs, quotes and delivery schedules. We welcome casual and planning estimate inquiries and we have a "No Hassle" sales policy; if we get an email, phone call, or web form from you requesting information, and we provide the information and/or a quote in an email, but do not hear back from you, we will send you at most only one follow-up email and no phone call unless you request one; if we do not hear back from you, we will assume you are no longer interested. Three or more identical signs or plaques with a price of $150 or higher each, ordered at the same time, receive a 5% to 10% discount on the total price. Wholesale prices for qualified re-sellers are substantially lower than the retail prices below. Product Line 1. Small raised letter or engraved 2.5-D HDU address or unit number signs/plaques (typically 6 inches x 4 inches in size) have prices of $40 each, when ordered in large numbers. Product Line 3. Small Mahogany wood engraved number address or unit number signs (typically 6 inches x 4 inches in size) have prices of $85 each, when ordered in large numbers. Product Line 7,. Custom raised number or engraved 2.5-D metal-plated (bronze, brass, copper, silver, aluminum) HDU address or unit signs/ plaques (6 inches x 4 inches) have prices of $75 each when ordered in large numbers. Product Line 1. Custom carved, sandblasted and/or engraved 2.5-D HDU single-face signs, 10 inches up to 18 inches wide, with two colors, have prices from $70 to $170 (where the price increases with sign area). A small 3-D carved hand-painted applique mounted on a 2.5-D sign has an additional cost of $30 to $50. Product Line 2. Custom carved 3-D bas-relief HDU artist-painted single-face signs, 10 inches up to 18 inches wide, with 5 colors, have prices from $200 to $455 (where the price increases with sign area). These signs have 100% of their areas carved in 3-D bas-relief; a lower price alternative is to order 2.5-D signs 12 inches to 18 inches wide with a single small area 3-D carved applique (see paragraph above), which have prices of $120 to $240. Product Line 3. Custom carved, sandblasted and/or engraved 2.5-D wood (Mahogany , Cedar or Redwood) single-face signs, 10 inches up to 18 inches wide, stained and/or painted two colors, have prices from $156 to $311 (where the price increases with sign area). Carved 3-D wood signs have prices from $277 to $461. Product Line 7, Custom carved 2.5-D flat-relief and/or engraved metal-coated (bronze, brass, copper, silver, aluminum) single-face signs, 10 inches up to 18 inches wide, with painted or patina backgrounds, have prices from $133 to $290 (where the price increases with sign area). A round bronze 3-D sign or plaque 18 inches in diameter has a price of $590. Product Line 1. Custom carved, sandblasted and/or engraved 2.5-D HDU single-face signs, 24 inches up to 36 inches wide, with two colors, have prices from $251 to $430 (where the price increases with sign area). A small 3-D carved hand-painted applique mounted on a 2.5-D sign has an additional cost of $50 to $75. Product Line 2. Custom carved 3-D bas-relief HDU artist-painted single-face signs or plaques, 24 inches up to 36 inches wide, with five colors, have prices from $453 to $638 (where the price increases with sign area). These signs have 100% of their areas carved in 3-D bas-relief; an alternative is to order 2.5-D signs 24 inches to 36 inches wide with a single small area 3-D carved applique which have typical prices of $300 to $500, depending on size. Product Line 3. Custom carved, sandblasted and/or engraved 2.5-D wood (Mahogany , Cedar or Redwood) single-face signs, 24 inches up to 36 inches wide, stained and/or painted with two colors, have prices from $433 to $819 (where the price increases with sign area). Carved 3-D wood signs have higher prices. Product Line 7, Custom carved 2.5-D raised or engraved letters & art metal (brass, copper, silver, or aluminum ) single-face signs or plaques , 24 inches up to 36 inches wide, with a darker painted or patina background , have prices from $443 to $737 (where the price increases with sign area). A round bronze 3-D bas-relief plaque 24 inches in diameter with a background patina has a price of $774, and a round plaque 36 inches in diameter has a price of $1210. Product Line 1. Custom carved, sandblasted and/or engraved 2.5-D HDU single-face signs , 48 inches up to 96 inches wide, with two colors, have prices from $550 to $1420 (where the price increases with sign area). Product Line 2. Custom carved 3-D bas-relief HDU artist-painted single-face signs , 48 inches up to 96 inches wide, with two colors, have prices from $913 to $2399 (where the price increases with sign area). These signs have 100% of their areas carved in 3-D bas-relief; an alternative is to order 2.5-D signs 48 inches to 96 inches wide with a single small area 3-D carved applique (see paragraph above), which have typical prices of $650 to $1520, depending on size. Product Line 3. Custom carved, sandblasted and/or engraved 2.5-D Cedar, Redwood Wood single-face signs, 48 inches up to 96 inches wide, stained and/or painted with two colors, have prices from $1232 to $3674 (where the price increases with sign area). Product Line 5, Very large HDU and Wood signs, 96 to 240 inches wide, typically cost $2200 to $6500, depending on sign size. HDPE signs in from 96 to 144 inches wide cost from $1600 to $2200+. Aluminum signs from 96 to 144 inches wide have prices from $900 to $1200+, depending on sign size. Structural supports such as frames, support cross-beams, vertical beams, attachment brackets, and posts are extra. Product Line 6, Large EPS integrated monument signs, range from 6 feet wide to 12 feet wide. The prices for sizes 8 feet wide range from $4500 to $9000+, plus shipping. Our prices for integrated EPS monument signs are highly dependent on size, design, and special features such as faux stone or brick facing, columns, arches, etc. Gallery 6 provides detailed information and over 60 different designs for these types of signs. Large post-and-panel wood and HDU entrance signs in Product Line 6 (with posts) typically have prices from $850 to $2700+ A 4 feet wide and 2 1/2 ft high single-faced 2.5-D HDU sign, with posts, has a price between $900 and $1100+. A larger single-faced HDU sign, 6 feet wide and 3.5 feet high, complete with wood posts, has a price between $1500 and $1800+. The same size sign made of Western Red Cedar, with two wood posts, has a price between $2400 and $2700+. A large 8 ft wide and 4 ft high single-faced HDU sign, complete with two 4 x 4 Redwood posts, a cross-bream on top and bottom, and a steel frame on the back, has a retail price from $2200 to $2700+, depending on sign complexity and design. Discounts are given for very large signs or for an order of several signs of the same size and design. Wholesale prices to qualified re-sellers are substantially lower than these retail prices. F. Posts, Scroll Brackets, and Wrought Iron Fixtures and Supports. Product Line 4. Premium grade 4 x 4 kiln-dried Cedar Wood posts, cut to size with custom top (flat, slanted or pyramid), sanded, primed and painted to match your sign, have prices of $130 each. Steel square posts or aluminum round posts have prices typically $100 to $200+ each, depending on diameter (3 or 4 inches), length, design and material. Aluminum posts have higher prices. Decorative metal and carved wood finials are typically $50 to $100 each. Decorative bases (optional) for aluminum or metal posts have prices ranging from $150 to $400+ each. Standard and decorative scroll brackets in Product Line 4 have prices from $75 to $500+, depending on size and construction. .
We offer factory-direct economical prices on our custom dimensional signs, without sacrificing high quality. We do not employ salesmen, or have an expensive showroom, or print expensive catalogs, or run expensive ad campaigns; consequently you pay only for the raw materials and the direct labor to design and build your custom sign, which is typically 60 to 80% of the cost of most sign retailers. The retail prices for our signs and plaques, like most sign companies, are primarily determined by sign area (maximum width x maximum height), in square feet. Large signs are more expensive than small signs. We Use Premium Materials. For our signs & plaques, we use only the highest grade materials for outstanding appearance,long lifetime, and low maintenance. The cost of materials we purchase is very high, because we buy only the best quality premium wood, High-Density-Urethane (HDU), paint, metal-coating, clear-coats, and adhesives, both for appearance and long lifetime without maintenance. For example, we pay $550 for a 5 x10 ft sheet of 2 in thick 20 lb/ft3 High-Density-Urethane (Premium Precision Board from Coastal Enterprises). Other sign companies use softer, less robust 15 lb/ft3 HDU. We only use prime Class A kiln-dried all heartwood vertical-grain Redwood and top grade Cedar wood with no knots or imperfections and matched colors; the wood blanks (before carving) cost us from $30 to $50 per square foot, purchased from a lumbermill that specializes in making wood sign blanks. Our special 2-part automotive-type non-fading sign paints and clears are Low VOC Matthews Acrylic Polyurethane Paints (MAP). We also use Famous 1-Shot Sign Enamels for trim, text and artwork. Both of these types of paints cost around $200/gallon. Our metal-coatings cost up to $800/gallon. Our raw materials are typically 30% to 35% of the cost of the sign; the larger the sign, the more materials and labor are required. Use of these premium materials enables us to produce long-lasting, low-maintenance signs & plaques that will last more than 10 years, usually 20 years or more, in any climate. Design and Fabrication By Expert Craftsmen. Larger and more detailed and complex signs require many hours of labor by skilled and experienced craftsmen.We start with a 3-D computer geometric model of the sign or plaque to be built. We employ the finest modelers in the USA and the UK to create these custom models. We use a very cost and labor efficient computer-aided-design and manufacturing (CADAM) approach to cut and carve these models, followed by hands-on precision detailed carving, sandblasting, and sanding by our master sign craftsmen.This combination produces very high quality, precision dimensional custom signs and plaques that are hand-crafted yet economical. Our computer design software, along with numerically-controlled carving machine technology, has resulted in a large increase in productivity and quality, as well as a decrease in cost. Even when this technology is used, making custom wood and HDU signs and plaques is still very labor-intensive and time-consuming, and requires experienced craftsmen who are expert in woodworking and precision painting, each using a different hand-crafted process, to make our custom signs. Each sign or plaque undergoes 18 to 22 separate operations during its manufacturing cycle and is worked on by 3 or 4 craftsmen. The minimum time to make a sign or plaque, from start to finish, is 21 days, because we use up to 5 different powered machines, 4 or 5 CNC router tool bits, and perform extensive hand-trimming, masking, and hand-sanding, and we require a minimum of 2 weeks to dry the 6 to 8 coats of primer, background paint/stain/metal coat, trim and lettering paint, and clear-coats. Gold or silver-leafing, metal coat polishing and burnishing, and fine painting is all done manually by skilled artisans and artists. Although we use a paint spray booth to apply our coatings, all of the fine painting is done by hand with a micro-roller, airbrush, or artist brush, which takes several hours per sign. In addition to sign or plaque area, the price is also determined by whether the sign is single or double-sided (a double-sided sign is 50% more than a single-sided sign), material type (HDU has a 40% lower price than Cedar, and is 20% lower in price than Redwood or Mahogany woods). Metal coating and gold leafing gilding is the most expensive of our surface coatings. Price also depends on sign thickness (varies from 1 inches to 3 inches), and whether the sign is 2.5-D sandblasted/routed, or 3-D bas-relief carved. Sandblasted and routed 2.5-D signs are about 30-40% lower in price than 3-D carved signs. Finally, we add costs for upgrades as such as custom 3-D carved appliques, separate letters on standoffs, built-up overlays, gold-leaf gilding, metal coatings, very detailed multi-color painting, hand-carving, laser engraving, full-color digitally printed vinyl appliques, exotic woods, extra thick signs or plaques, etc. Product 1 Line signs (2.5-D sandblasted or CNC carved HDU) are less expensive than Product Line 2 (3-D sculptured bas-relief HDU) or Product Line 3 (2.5-D and 3-D Wood) signs. Product Line 7 (metal-coated and gold-leaf gilded) plaques are the most expensive. The integrated EPS monument signs in Gallery 6 are not priced by square foot, but by overall size and special features such as faux stone, brick, columns and arches. The aluminum and wrought iron posts, finials, bases and scroll brackets are priced based on size and design complexity. Because every sign and plaque is custom designed, and can have a range of sizes and design features, we do not post the price on each sign in our Product and Application Galleries, but we do give guideline prices in the RETAIL PRICES section near the top of this page. Instead we will provide you a specific written firm price quote by email once we know the sign size, type of material and approximate design .Please refer to the ID number. Our Customer Service Representatives, Christie and Regina, can help you select these design parameters if you can describe the sign's use or application, how the sign will be mounted, and specify the viewing distance and text. We normally have a minimum order of at least $150 (total order, which may consist of several signs, wrought iron hangers, etc) for signs that require a new design . Double-faced, extra thick, and special feature signs will cost extra, as described above. For very large orders (dozens to hundreds of signs), or very large signs, we offer substantial discounts, typically 10-15%, from the above retail prices. Our prices for these premium signs are among the lowest in the US. Customers ask us, how can we offer these low prices? In five words, "factory-direct and design & production efficiency." We use the latest automated technology, completely computerized design, computer-controlled machines for manufacturing,and we have a very skilled and experienced staff, along with low labor / overhead rates and high volumes, which enables us to reduce our costs and pass the savings on to you. We use exactly the same (or better in many cases) high-grade materials as our more costly competitors, and our designs and hand-craftmanship are outstanding. Large flat 2-D signs, made of aluminum sheet, PVC, acrylic, HDPE, MDO/HDO (smooth waterproof plywood) or Extiria board are our least expensive signs, less than 1/2 to 1/5 the cost of our carved wood and HDU dimensional signs (i.e.$35/ft2 to $15/ft2). MDO/HDO and Extira board have a much shorter life and require more maintenance than HDU, and are not recommended for rainy/4 season climates or where sprinklers can hit them with water. Thin aluminum signs (like Stop signs) are least expensive, but they also look cheap. We also offer both custom and standard wrought iron and aluminum hangers and posts, finials, decorative bases, frames, stands and brackets; the custom ones have higher prices. See Product Line 4 for these items. Our 2.5-D designs are included at no cost if you buy the sign, unless the art design is very intricate AND you only have a photo of, rather than a vector computer file (we then have to redraw it at a small cost). For smaller signs (under $1000) that require us to develop a new unique design to your requirements, we charge a nominal $30 for the design of the proof, which is then credited to the price of the sign if you buy it. This design fee covers five (sometimes more) design iterations. We do not charge this fee for larger orders or to sign resellers, most who do their own designs.There may also be a small redrawing fee if complex raster (e.g., JPEG) art, rather than vector art, is provided. Most sign companies charge from $150 to $250 for design fees, and do not give a credit if you buy the sign-their design is not free. 3-D sculpted bas-relief signs may have a detailed production design fee for detailed computer modeling of the 3-D surface, if we have not made one previously or it is not in stock. Ground Shipping to the US and Canada is typically an additional 5-15% of the sign price, depending on your location compared to Southern California.. California sales tax must be added on to signs delivered to California addresses only. Canadian orders have a small customs fee. Please call or email us for an exact price or quote on any item shown on this site or for your unique custom design. For an exact price on your custom, unique sign or plaque,or wrought iron or aluminum posts and hangers, please call us, email is, or send us Request an Estimate Form , and we will respond promptly with a quote, usually by the next day. (1) Wood vs HDU for Outside Signs. For outside signs, we recommend painted HDU over wood. HDU is less expensive. lasts much longer, and requires much less maintenance than Cedar or Redwood for an outside sign, especially in 4 season northern climates. However, we do sell wood signs, which have one advantage-they are less susceptible to vandalism and impact accidents because they are tougher and more impact resistant, particularly for free-standing signs (i.e., post-and-panel signs). 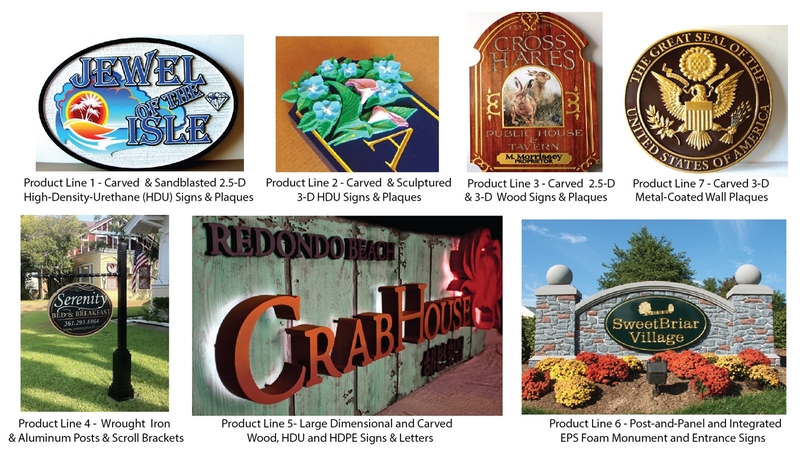 HDU Signs are described in Product Lines 1 and 2 (Galleries 1 & 2) and Wood signs in Product Line 3 (Gallery 3). (2) Sign Size. Make sure your sign is large enough for its intended purpose-many people order their signs too small (because it saves $) and are disappointed when they put them up ; see the paragraph below "How do I specify my Sign shape & size?" (3) Most Popular Signs at an Economical Price. Our least expensive, most popular, most versatile signs and plaques, recommended for most applications, are multi-layer sandblasted or CNC routed 2.5-D HDU signs with hand-painted art. You can get a great looking original unique sign or plaque for an economical price. Examples of these signs are in Product Line 1 (Gallery 1). (3) Elegant and Formal Signs. Our most elegant, formal and beautiful signs,sometimes referred to by our customers as "works of art", are often ordered for churches, law firms, doctor offices, financial institutions, and upscale retailer stores (e.g., jewelry, boutiques, etc) , are our HDU or wood signs with V-carved, 24K gold-leaf gilded text and 3-D carved sculpture hand-painted HDU appliques. Some or all of the areas on these signs or plaques can also be bronze, brass, copper or silver-nickel metal-coated. Examples of these signs are in Product Line 2 (Gallery 2) and the engraved Mahogany signs in Product 3 (Gallery 3). (5) Free-standing Outside Sign Support and Monument Signs A simple double wood post (4 x 4 or 6 x 6) and crossbar sign support system is the least expensive option for large (to 12 ft wide) one- or two-sided outdoor signs, A single wood post and a wrought iron hanger (scroll bracket) is inexpensive and looks great for signs 18 to 48 inches wide. Wrought iron posts and reverse scroll brackets look most elegant, but are more expensive. These are described in Product Line 4 (Gallery 4). We can supply iron or wood sign support hardware, or you can have wood posts and supports made locally. Large free-standing HDU signs often required support with steel or aluminum backing plates, perimeter frames, or vertical beams in back of the sign (or sandwiched between the two faces for large double-faced signs). Large free-standing wood signs 2 inches thick or greater usually do not required this type of structural reinforcement, because they are stronger. For large outdoor entrance signs, often referred to as monument signs, we offer three different types: (1) double post and panel, described at the beginning of this paragraph; (2) constructed stucco, stone or brick bases with the sign mounted on the base (Southern California only); or (3) EPS foam base and pillar monuments. These types and their prices are all described in the Photo Gallery for Product Line 6. (6) Naturally finished outside wood signs. We do make these, but please be aware they may require annual or bi-annual maintenance (clear-coating) if they are exposed to rain and snow, and will eventually need refinishing (except the very rustic uncoated barnwood or redwood signs, which actually look better as they age) . See Product Line 3 (Gallery 3) for examples. (7) Inside signs and plaques. Naturally finished wood (mahogany, maple and cherry are good choices) looks richer and more elegant than painted wood or HDU, but the wood must be stained either dark with white or gold lettering, or lightened up so that black letters can be easily read. Painted indoor HDU signs with carved bas-relief or multi-level sandblasted art and text can be very beautiful and detailed (e.g., seals, coats of arms, logos, etc). 24K gold leaf (additional cost) adds beauty to both indoor and outdoor HDU and wood signs. Our metal-coated HDU signs (bronze, brass, copper, nickel-silver,aluminum, stainless steel, and iron) wall plaques (see Product Line 7) look very identical to cast metals at a third of the cost, and last forever. Generally every sign or plaque we make can be installed either indoors or outdoors and will look great after many years. Inside signs and plaques are shown primarily in Galleries 9, 22, 28B, and 30-35; the other Galleries mostly show outside signs. (8) Metal-Coated Signs & Plaques. One of our specialties is building metal-coated plaques.We first carve the plaque in 3-D High-Density-Urethane, them apply a veneer of real metal in a proprietary cold-casting technique. The metal can be bronze, brass, copper, nickel-silver (sometimes called German silver), stainless steel, or aluminum. We the polish and burnish the metal to a high shine in raised areas.We then may apply a patina or enamel paint to the backgrounds to give more contrast. These are beautiful plaques, indistinguishable from cast metal plaques, that will last a lifetime.They cost 1/3 as much and weigh 1/5 as much as hot cast metal plaques.They are ideal for courtrooms and other high-end facilities where a metal bas-relief plaque adds dignity to the area. Gallery 7 shows many examples of this type of sign or plaque. (9) Attachment Techniques. For wall-mounted signs or plaques, we recommend a keyhole or epoxy on the sign back (for small, lightweight interior signs or plaques), z-clips or a French cleat ( for larger, heavier signs). or L-brackets or threaded studs (for the largest, heaviest signs). For post mounted free-standing signs, we recommend steel side bars. For the larger (greater than 6 feet) , heavier HDU signs, we recommend a perimeter steel frame with steel vertical bars on the back of the sign or a sheet aluminum backplate. Large wood signs usually do not require this steel reinforcement. For hanging signs, we recommend eye-hooks, sometimes welded to a perimeter frame (for larger, heavier signs). For large wall-mounted or monument-mounted signs, we recommend threaded studs on the back of the sign. You do not have to know all (or any) of the information below to order a sign !! ; our friendly and knowledgeable customer relations staff, Christie and Regina, will be happy to help you select and create your perfect sign design. You can call them at 951-698-8484 or email them at info@artsignworks.com. They are very knowledgeable about all types of signs we make, and if you do not already have a design, will be pleased to recommend one or several options based on your specific requirements. How do I specify my Sign Size and Shape? The most frequent question asked by clients is "How large should my sign be?". Sign size can be determined by either (1) physical limitations due to sign mounting or installation (i.e, only so much space available, as for a front door or between two existing sign posts, or specified by a Sign Ordinance) or (2) requirements for viewing and readability. Sign sizes basically depend on location and use. If you are going to mount your sign on your front door, the sign must be quite small (typically 12 to 14 inches wide, and 4 to 6 inches high.). If it is on a wall outside your door, it can be larger (20 to 40 inches wide). If it is on a separate, larger wall (like as restaurant sign), to be viewed by pedestrians, the width can range from 36 to 72 inches wide and 10 to 36 inches high, depending on how far away it is viewed (e,g,,across a lawn or right next to a sidewalk). Signs mounted on a single post for close pedestrian viewing are typically 20 to 30 inches wide and 10 to 20 inches high. Signs hung from an overhead projecting hanger (blade sign) over a sidewalk should be at least 30 inches wide, up to 48 inches, since they will of necessity be viewed from 50 to 75 feet away from or across the street. Signs mounted on double posts, that can be viewed from a slow-moving car, as on a driveway, should be from 42 to 86 inches wide. Signs that are viewed from more than 150 feet away from a faster-moving car should be 8 ft to 14 ft in width . (1) where will the sign be placed and how will it be mounted;? (2) how far away will people be that you want to read your sign? (e.g, 10 ft, 50 ft, 200 ft?) (3) what is the longest line of text that you will have on a single line (no.of characters & spaces)? Using these three pieces of information we (or you) can determine the approximate size sign required. A design is required to get a more precise size. Most signs are designed using the heights of letters as a criteria. Letter heights on signs we make typically run from 1 in high to 12 inches, which very roughly correspond to sign widths of 12 inches wide to 144 inches (12 ft ) wide. (assuming 10 characters & spaces on longest line of text). These signs can be read from 25 ft away (1 in high letters) to 300 ft away (12 in high letters). Door signs may be 12 inches wide, whereas Monument signs or double-faced signs along a highway can be 12 ft or wider, so fast moving cars hundreds of feet away can read the sign. For most of our outdoor freestanding, building wall, or blade signs that need to be read from a distance of 75 ft or closer, we like to have at least 3 in high letters. The width of a sign with 3 in high letters is typically 24 to 48 inches, depending on the length of the text and art, if any. A simple very approximate formula for sign width is: W=1.2 x N x d/25, where W=Sign width in inches, N=No.of characters & spaces in longest text line, and d=Maximum distance from reader to sign on feet. For example, if the sign is to say "Bob's Hideaway "(14 characters), and the distance from reader to sign is 50 feet, then W=1.2 x 14 x 50/25 = 32 inches, and the letters are 2 inches wide (h = 50/25) and approximately 2 inches high. The height of the sign depends on the number of lines of text and size of artwork, if any. For most multi-line signs , sign height is 50% to 100% of the width. As far as shape goes, it is mostly a question of style and the message you want to display. Do you want a simple, rectangular sign or an ornate (decorative) sign? Do you want it wide and short or narrow and tall, or in between? Do you want the sign to stand out or naturally blend into the background (like park and golf course signs)?.Do you want an elegant shape or a strong, bold shape? We can make virtually any other sign shape on a custom basis. If you want help to determine exact dimensions, please let us know, and we will be happy to help you. Exact sign width can be specified, but exact sign height can only be determined when a complete design layout is done and text is combined with art on a specific sign shape. Which should I select, Wood or High Density Urethane (HDU) , for my outdoor sign or plaque ? We recommend that painted outdoor signs be made of High-Density-Urethane (HDU), rather than Redwood or Cedar, because they last longer, require much less maintenance, and will not rot or crack. 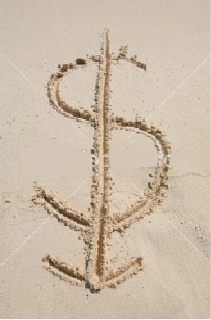 HDU has been the material of choice for outdoors in the sand-blasted sign industry for many years. HDU is impervious to water and will not rot because of its closed-cell construction, and it has good temperature stability so that it will not crack due to freezing and thawing. This provides greatly superior weather resistance compared to wood. Also, paint finishes last considerably longer, and will not crack or peel like they sometimes do on wood. A dramatic grain pattern on HDU can be created using a multi-wire stencil (i.e., grain-frame) during the sandblasting process, so that the background of the sign looks just like sandblasted redwood grain. Alternatively, we can make the background look like sandstone or leave it smooth (for applique or incised letters). However, HDU is not as strong and does not have the surface hardness of wood. A double-faced HDU sign must be thicker than one made of wood. We use 20 lb/ft3 HDU for our signs and plaques, which is 40% stronger than the 15 lb/ft3 HDU that other sign manufacturers use. We also may build a wrought iron (mild steel) frame on the periphery of the sign, or for our largest HDU signs (8 ft or larger), we may also build a lattice frame made out of steel or a solid aluminum sheet behind the signboard, to provide greater strength for high wind loads and possible impact. We can supply wood (cedar, Redwood or pressure-treated fir), steel, or aluminum posts and crossbeams. We can also arrange to have a local sign company near you install a sign we send to you. However, we do make painted Cedar and Redwood outdoor signs if you wish; about 20% of our painted outdoor signs are made of Redwood or Cedar, especially when high strength and ruggedness is required. For example, the National Park Service requires park signs be made of 2 inch thick Cedar, for strength reasons.We prime our wood signs twice, put 2 coats of the best acrylic latex (Matthews two-part automotive type paint or MAP (costs $200/gallon or more) over the entire sign, then two coats of 1-SHOT lettering enamel on the letters, borders, and art. We then finish the signs with two coats of a Matthews UV-resistant clear-coat. Properly maintained, a painted outdoor wood sign should last for many years, but an HDU sign will last much longer and require much less maintenance. If you want a naturally finished wood outdoor sign, California Redwood is the preferred choice, but Western Red Cedar is also suitable. We also make outdoor naturally finished signs from Mahogany. However, all of these signs require annual maintenance . Clear-coating allows UV damage (which paint protects against), and water is more likely to enter the wood than a painted wood sign. Yearly sanding and clear-coat refinishing may be required in extreme climates. Think of a varnished wood boat and all the maintenance it needs. MDO (Medium Density Overlay) or HDO (High-Density-Overlay) are waterproof plywoods that is only suitable for flat signs (2-D) However, it cannot be carved or sandblasted. Exteria board, which we use occasionally, is less expensive than HDU and can be carved and sandblasted, but will not last as long and will deteriorate and absorb water if even a small spot ot protective paint is removed; consequently we seldom use it. We also make custom aluminum signs, both small and large (to 10 feet). Aluminum is strong and holds up well in severe climates when painted, but will eventually corrodes, especially in salt air. What are the differences between sandblasted, engraved and carved signs and plaques? What are 2-D, 2.5-D, and 3-D signs and plaques? This section describes the types of design and construction of our 2-D, 2.5-D, and 3-D signs (sandblast vs Computer-Numerically-Controlled (CNC) carving vs hand-carving, raised letters, engraving, V-carving, 3-D bas-relief appliques, naturally finished vs painting, gold-leaf gilding, digital vinyl appliques, etc). This section applies to both wood and High-density-urethane (HDU) dimensional signs and plaques. First, some definitions. We refer to flat signs as 2-D; they have painted letters, solid color vinyl, or printed vinyl adhered to a metal, plastic or MDO water-proof plywood signboard. They are smooth and flat with no (zero) relief. Relief is defined as the elevation difference in inches from high point of sign surface to the low point. Examples of 2-D signs are stop signs, aluminum street signs, and real estate signs. We do make 2-D signs using Color Core HDPE, MDO plywood, PVC, and aluminum signboards, but our specialty is 2.5 and 3-D signs and plaques. 2-D signs are less than one third the cost of 2.5-D and 3-D signs, because both material and labor costs are much lower. 2-D signs with aluminum or plastic signboards and vinyl lettering are the cheapest signs you can buy (most local sign shops sell them), but they also look it. Most 2-D signs are quite thin (1/4 to 1/12 of an inch) compared to dimensional signs (1 to 3 inches). We call 2.5-D , 3-D and engraved (incised) signs dimensional signs. These have text, art and borders either elevated (raised) above their backgrounds or engraved (cut or recessed ) into a thick, carvable signboard substrate. 2.5-D signs are made with elevated or outlined multi-level flat areas; the most common are two levels, the sign background at one depth and the text, art and borders at another level, but there can up to 7 different levels instead of just two. Most 2.5-D signs are made with first CNC routing and then (optionally) sandblasting some background areas. These have 0.5 to 0.75 inches of maximum relief. 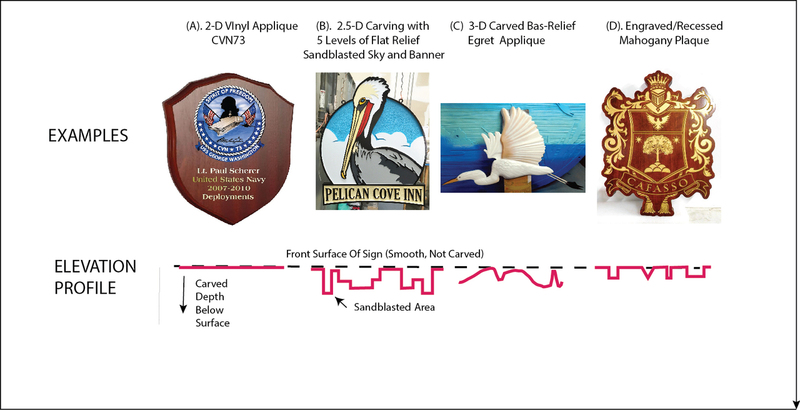 3-D signs have true continuous and curved elevation level changes, rather than "plateau" stepped levels like the 2.5-D signs have; these are similar to bas-relief sculptures, and usually have more relief (depth differences over the sign area, typically 0.5 to 1 inches) than 2.5-D signs. The term "bas-relief" describes a low-relief sculpture, such as the Greeks made for marble panels on their Parthenon or other temples. Our 3-D bas-relief signs are made with a 3-D CNC (Computer Numerically Controlled) router/carver, or occasionally they are hand-carved. Product Line 1 has 2.5-D signs; Product Line 2 has 3-D signs; and Product line 3, wood signs, has both 2.5-D and 3-D signs & plaques.Product Line 7 shows mostly 3-D plaques coated with brass, bronze, copper, aluminum, gold, silver, nickel or stainless steel. We offer three basic types of 2.5-D and 3-D signs: (1) raised or elevated text and art, which are higher than the sign's background (i.e., closer to the viewer), (2) engraved (also called incised, recessed or V-carved) text and art, which are lower than the background, (3) both raised and engraved text and art on the same sign. There are three ways of making these three types of 2.5-D and 3-D signs. We use (1) one of our three large Computer-Numerically-Controlled (CNC) routers (5 x 10 ft table) to carve away material ,(2) sandblasting (spraying abrasive particles at high pressure on a wood or HDU surface, eroding material from the surface) and (3) hand-carving (sometimes we use 2 or even all 3 of these techniques for a single sign) to make our many types of signs. We first use method (1) on all signs, often use method (2) on some of the background areas on some of the signs, and occasionally we use method (3) to carve away material the CNC route cannot do (e.g., undercuts). On all of our signs, we do hand-trimming, hand sanding and some hand-carving to produce a smooth, highly finished sign or plaque. Raised Text and Art. Text and art "pop-out" from the background and are elevated from 0.5 inch to 1.5 inch above their baxckgrounds (up to 6 inches with cut-out letters on stand-off pegs). For most of our raised text signs, the HDU or wood material in background areas is removed by sandblasting or carved out with a CNC (Computer Numerically Controlled) router. These are then hand-sanded by our craftsmen to make a perfect sign. *CNC Carving. To make a true 3-D raised letter sign is to use our large CNC router/carvers (5 x 10 ft table) to produce raised text and art. It is more precise and versatile, because it uses very small high-speed rotating tools (1/16 or 1/32 inch diameter bits) that are computer controlled to create fine and precise details. The CNC carver can remove the background material very accurately, making it flat or smooth, and make any bas-relief pattern. Although it can make multiple flat layers like sandblasting, generally we program it to make true 3-D surfaces with continuous curvature,rather a series of flat plateau steps. Thus it can round the top of letters, make them prismatic (V-shaped), create 3-D bas-relief art, and make any 3-D profile we wish. All of our signs use the CNC router to cut out the signs, and carve borders, text and art. Some of our signs are then lightly sandblasted in some areas to create the sandstone or wood-grain pattern, usually on the background, but sometimes on text and art. A true 3-D CNC routed sign is a “step up” in appearance compared to 2.5-D sandblasted signs, usually at a small additional cost. *Sandblasting. HDU produces either a very attractive sandstone (roughened granular) surface; or using a wire frame as a blocker, it will make a dramatic wood-grain like surface with tiny ridges and valleys, looking very similar to sandblasted Redwood. Generally unblasted areas like text and art remain smooth and flat, since a sandblast mask ( a rubber-like adhesive mat) protects the original smooth flat surface from being eroded. We can do multi-layer blasting, sequentially removing masks as we blast, creating as many as 5 different layer levels, each separated by 0.1 to 0.2 in differences in depth. Thus we can create multi-layer backgrounds, text, and art, giving more of a dimensional look. We sometimes call the multi-layer look "2.5-D", to distinguish it from true bas-relief 3-D which is described below. For multi-layer 2.5-D, each layer is flat (i.e.,, not rounded) , and all layers except the top layer will have a roughened surface, which can be hand-sanded smooth. We use this technique for outlined letters and art where one object should appear to be in front of another, for example. Of course we also sandblast wood (redwood, cedar, oak, alder, maple, old barnwood) to give dramatic grain patterns, which can either be painted or naturally finished, and can also be made rustic or antiqued. *Hand-Carving. We hand-carve some of our signs, because they may require more relief (i.e. depth) than the CNC carver can easily provide, or they require more artist control, or it may take less time to hand-carve a sculpture than to program our CNC carver for a unique design. Hand-carved signs are our most expensive signs because of high labor costs, and we use our CNC machine to do carving whenerver possible to keep our prices low. As mentioned above, we also hand-carve details for some multi-layer sandblasted signs, and also make very large carvings with high-relief or sculpture in the round. We use sand-carving (precise directed sandblasting) or CNC cutting & carving to make the approximate rough blank, then an artist sculptor carves the fine details with chisels, rasps, veniers, sandpaper, etc. Once we make one carved sculpture, we can automatically scan it with our CNC machine exactly and make hundreds of identical carvings robotically with the CNC carver. *Cut-Out Letters. The most dramatic 3-D elevated text and art is made by cutting out letters and pieces of art and either attaching them directly to a signboard (usually smooth but can be carved or sandblasted) with epoxy or screws, or with studs (steel pegs) which elevate them completely off the surface, such is done with metal letters on monument signs. We can provide custom cut-out letters any font style and size, to 8 ft high , made from aluminum, steel, acrylic, HDPE, PVC, HDU, or wood, complete with studs ready to attach. These can be painted in color or metal-coated. We can also build custom art, such as logos, that can be put on a signboard or a stone, stucco wood or brick monument or building wall. Cut-out letters can have flat , rounded or even prismatic (V shaped) top surfaces, and are made with our CNC router/carving machine. Fig 6 - Details Showing the Carving Profiles of the four Types of Relief (2-D , 2.5-D Flat Relief, 3-D Bas-Relief, and Engraved). Indoor signs may be made of HDU (if painted) or several types of wood (if naturally finished). Either will last many years without maintenance, because they are protected from UV, water and temperature extremes. . For indoor signs or plaques, wood is just as suitable as HDU. Nothing looks better than the beauty of naturally finished wood. For indoor naturally finished signs and plaques, we use hardwoods such as Mahogany, Oak, Maple, Alder, Cherry , and Teak ,as well as Cedar and Redwood. For painted or gold-leaf gilded indoor signs and plaques, HDU is a better choice and is less expensive. For sandblasted background, naturally finished signs we use clear premium kiln-dried California Coastal redwood, which has a more dramatic grain pattern than cedar. Cedar, Mahogany, Oak and Alder are more suitable for engraved signs, where the letters may be CNC routed, sandblasted, or hand-carved into the wood and the background is smooth, stained and clear-coated. Intricate 3-D wood carvings are best made from hardwoods such as Alder, Mahogany, or Cherry, because of their finer grain structure. The other alternative to raised letters and art is engraved (sometimes called incised) letters and art, for wood or HDU signs and plaques. This costs about the same as raised letters above, since material and labor are about the same. An engraved (incised) sign is created by cutting letters, borders and art into a usually smooth signboard, leaving the background smooth and flat. This is the opposite of raised letters, where the letters and art have a front smooth surface the same as the sign blank and the background is cut away. Engraving of large wooden and HDU signs and plaques can be accomplished by using our CNC router/cutter, . For letters, engraved depth profiles (i.e., cross-sections of cut depth) can be U-shaped, or V-shaped, or have a flat bottom and vertical sides. See Engraved Letters (we use their software) for a more extensive discussion. A CNC router or hand-carving can do any of these; reverse sandblasting (where the mask protects the background and leaves the letters exposed) can make only the flat-bottom profile, with the bottom roughened in a sandstone surface pattern, which is sometimes undesirable. Most of our engraved letters, any font style, are V-carved with our CNC router. These are sometimes referred to as pseudo-prismatic letters, we use V-carving or flat bottoms for most of our engraved signs. V-carved letters look especially beautiful when gold-leaf gilding is applied, because the reflection pattern changes as the viewer moves with respect to the sign. Engraved borders and art can be done a number of ways, but in all cases, material is cut out of the signboard leaving the front surface smooth and flat and the borders or art below the surface. Borders can have flat bottoms or can be V-carved. Art can be made with an engraved outline, or it can be recessed using a dished-out background with a raised 3-D bas-relief sculpture (CNC carved or hand-carved), with its high point still even with or below the signboard surface. Most often, however, 3-D art is made as a bas-relief appliqué so that is in front of the signboard surface; this is a hybrid sign, with engraved text and borders and raised 3-D bas-relief “pop-out” art. This combination is very elegant , especially when the text and borders are V-cut and gold-leaf gilded. It is often used for Church, doctor , lawyer and upscale retail store signs. If an “off-the-shelf” CNC carved bas-relief sculpture is selected, and gold paint, rather than 24 K gold-leaf is used, this sign type costs very little more than a simple sandblasted sign, even though it looks much more expensive. We can do this because our CNC carver eliminates most of the tedious manual carving labor normally required for such signs. Sometimes we naturally finish (stain and clear-coat) a wood signboard, engrave and paint or gold-leaf V-cut text and borders, and then epoxy a multi-color painted or gold-leafed gilded carved appliqué made of HDU onto the surface of the signboard. We finish our signs with a wide variety of coatings, including acrylic and enamel paints, stains (for wood), clear-coats, gold-, silver- and copper-leaf gilding, liquid metal coatings (bronze, brass, copper, aluminum, stainless steel, and silver-nickel), antiquing, and digital-printed vinyl. HDU and painted wood signs are painted with a coat of primer,and then 2 coats of Matthews two-part acrylic polyurethane paint (MAP) (similar to automotive type paint) We usually paint text, borders and art with 1-Shot lettering enamels, or they can be gold-leaf gilded. Natural wood signs are stained and then given two clear-coats. If digitally-printed vinyl as used as a gicleé appliqué, we use 7 yr cast vinyl which is then clear-coated twice to protect against fading from UV. Our signs , including substrates and finishes, have a 2 year warranty, but most will last 10 to 20 years without repainting or refinishing. The one exception is naturally finished (stained and clear-coated) wood in an outside location, which is subject to rain, snow, and UV. These natural wood signs need annual clear-coating to maintain the factory finish (if they are inside, they will many decades without maintenance), .If these outside wood signs are painted instead of naturally finished, they will need to be repainted every five to ten years.